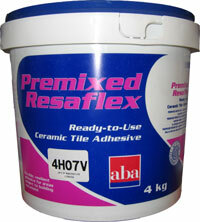 The main factor when choosing which adhesive to use is the material and type of base used for the mosaic. Always keep in mind the adhesive you choose has to adhere to the materials (tesserae) and also to the base to which it is stuck. The type of adhesive to use also depends on whether the mosaic is intended for indoors or outdoors use and the types of conditions that they mosaic will be subjected to. For example if you are making a mosaic hot pot stand, then you need to make sure the adhesive (and tesserae) are heat resistant and will survive in a kitchen style situation.